Forecast was a bit scary with the inshore saying 5-7 NE and the shipping forecast having the dreaded "perhaps 8 later" in it but as a North Easterly would mean it would be downwind hopefully we could out run it if it the 8 did come through. Not too good a start with everybody at the pin end so tacked away to get some clear air which put us in a good position to clear Snowden inside the landing craft which was moored on the Trinity House buoy. Good run down to the Forts with a strong tide under us and stayed in the Nab channel until we could pop the 90% kite. Bit hairy with a few broaches but speed was good for a few hours with plenty of surfs over 10 knots and maxed out with a sustained 15 knoter with bits of the boat humming we had never heard hum before. Kept the kite till 22:30 but by then we were 20 degrees off the rhumb line so took it down and white sailed. Kept a pretty good approach to the finish with only minor adjustments as we came in and slight confusion as we were expecting to see a light on the inner mark but there wasn't. 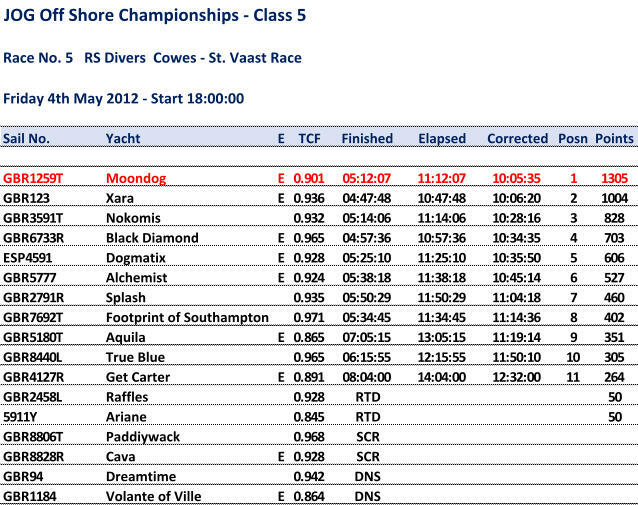 Heard Xara's finish time and worked out we could be ahead but surprised that we actually got the win. Needless to say additional beverages were required and a nice meal in a local restaurant. Pretty good trip back too and actually saw some sun eventually.